(The Street) — Heavy equipment maker Caterpillar ($CAT) took the wrecking ball to its 2016 results, bringing down sentiment about the health of the world economy in the process. The recovery figures to be a massive, time-consuming rebuilding project. Caterpillar reported Tuesday a third-quarter profit of $283 million on sales of $9.2 billion, down from a revised $559 million profit on $11 billion in sales in the same quarter a year prior. On a per-share basis and excluding restructuring costs, the company made 85 cents, beating a forecast of 76 cents but warned for a second time in 2016 that full-year revenue was likely to come in below expectations. For the full year, Caterpillar said it now expects sales of $39 billion compared to previous guidance of between $40 billion and $40.5 billion. Profit expectations also declined from $3.55 a share to $3.25, excluding restructuring costs. The results continue a bad run for Caterpillar, which has attempted to weather weakness in the commodity and energy markets that has led to more than three years of flat to down month-over-month sales by slashing 20% of its global workforce and restructuring its operations. CEO Doug Oberhelman, architect of a poorly timed $8.6 billion acquisition of mining specialist Bucyrus in 2010, earlier this month announced plans to step down early next year. While these latest results were expected by the markets, the outlook for 2017 wasn’t encouraging. Caterpillar management, who earlier in the year was still expressing hope that a turnaround could begin in 2016, said that uncertainty remains in many parts of the world going into the new year. Specifically, the company said it sees potential for upside going into 2017 from construction activity in China and other developing markets, and from increased sales to mining firms should sentiment in that sector slowly start to improve as expected. But Caterpillar warned that weakness in North American construction sales, lethargic economic growth in Europe and continued issues in the oil sector could be drags. Commodity prices, according to Caterpillar, appear to be on the upswing, though it isn’t clear whether they will be high enough to drive increased sales of heavy-duty equipment. The problem is not just economic weakness, it is also a glut in some of the big-ticket machinery that Caterpillar makes. North American construction, for example, is expected to be weak in part because of the large amount of used equipment available for sale and rent, and not because of a falloff in building starts. 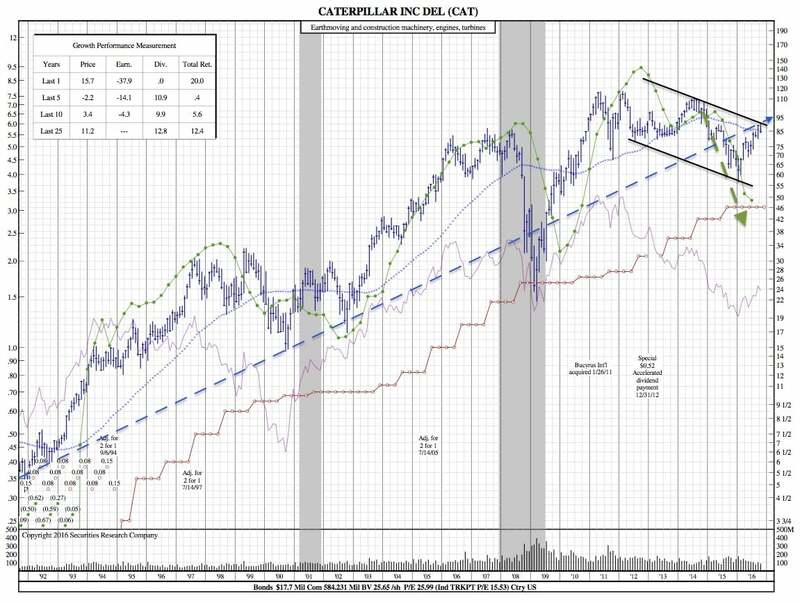 For all of Caterpillar’s current issues, Oberhelman and his team have set up Caterpillar to benefit when those end markets do recover. The company remains on track for about $2 billion in cost reductions in 2016, including the benefit from restructuring and layoffs as well as from equipment design and material-sourcing-related cost reductions and lower incentive pay. The company also has more than $6 billion in cash on its balance sheet. If one looks at CATs 21-Month Chart, they would see the strong price performance over the last year (15.7%). However, when we zoom out to this 25 Year scale, we see that a downtrend exists and is being strongly driven by weak earnings. Caterpillar’s earnings have fallen nearly 40% over the last year and -14% over the past 5 years. One positive is the consistent dividend growth and CAT looks like it may be ready to increase again based on past timing and in an attempt to attract investors.